Our Indigenous brothers and sisters deserve better than this. Let the rich run pipelines through their own properties and see how many are built. 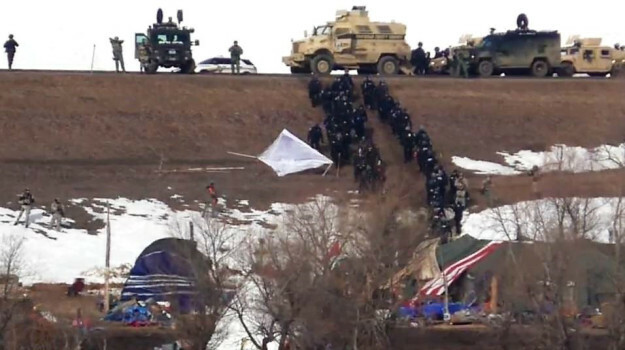 CANNON BALL, N.D. (AP)– Police in full riot gear began arresting Dakota Access pipeline opponents who remained in a protest camp in North Dakota on Thursday in defiance of orders to leave. Most protesters left peacefully Wednesday, when authorities closed the camp on Army Corps of Engineers land in advance of spring flooding, but some refused to go. 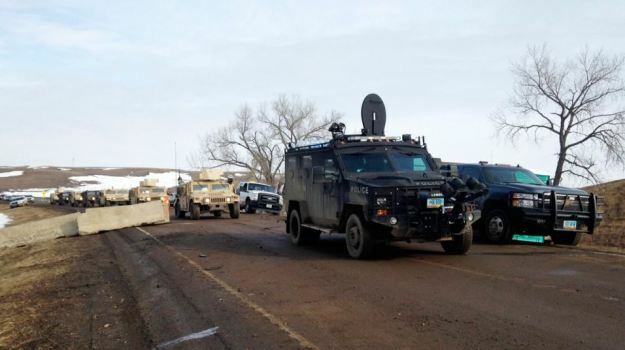 Eighteen National Guardsmen and dozens of law officers entered the camp from two directions shortly before midday Thursday, along with several law enforcement and military vehicles. A helicopter and airplane flew overhead. Officers checked structures and began arresting people, putting them in vans to take to jail. The number of arrests wasn’t immediately known.